Searching for Bonobo in Congo » Where are the Bonobos — and Why? The edge of the forest — seems to be a favorite place to be. Thanks for the photo, Colleen! 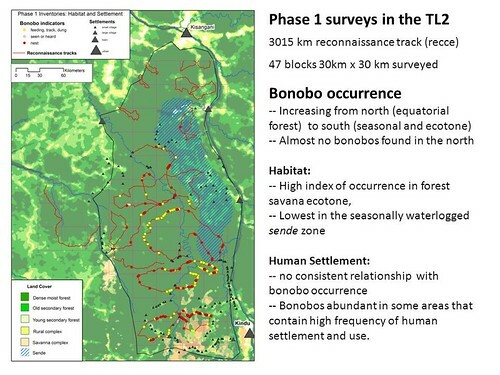 Our surveys in the TL2 landscape evaluate the effects of environmental gradients and human activities on the distribution and abundance of bonobos at a large spatial scale representing over 10 percent of the bonobo’s global range. After walking 3015 km of survey we could report bonobo distributions over 43,000 km² of forest. 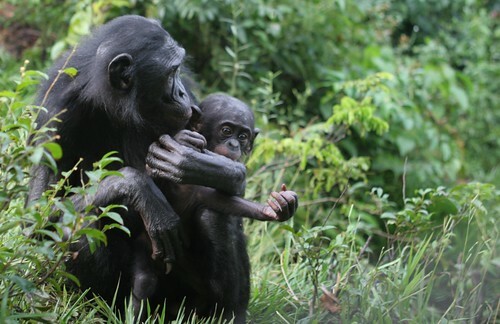 TL2’s bonobos show a marked north-south increase in abundance. This geographic trend or cline follows a gradient from closed, tropical equatorial forests in the north to a more seasonal mosaic of forest and savanna in the south. High numbers of bonobos are also reported at the savanna ecotone of other sites, notably by Jo Thompson in the Lukuru area and by Inogwabini Bila Isia and Jonas Eriksson at Malebo, the far western edge of the bonobo’s range. The TL2 landscape is a third case of what appears to be an important trend. Yet the reasons for this remain poorly understood. In the TL2 we found some environments that the bonobos avoid. Few bonobos are found in the seasonally waterlogged, stunted forests locally termed “sende” that cover large areas of the landscape underlain by white sand deposits between the Lualaba and Lomami Rivers. Swamp forests are not favored by bonobos elsewhere in their range and we were not surprised to find the TL2’s black water sende forest avoided as well. More confounding was the geographic variation in the impact of hunting pressure and human settlement on bonobo abundance. We found some evidence of hunting almost everywhere in the TL2 landscape, even in the areas most remote from settlement. 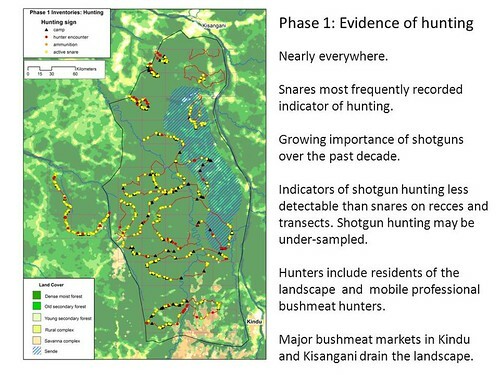 Yet bonobo occurrence was sometimes high, even in areas of commercial bushmeat hunting. Just as surprising, were the very low numbers of bonobos we found in the vast upland forests in the most remote sectors of the landscape, bastion of the landscapes last population of elephants and where we had initially predicted we would find bonobos to be abundant as well. These areas have just begun to be tapped for the bushmeat trade. A history of hunting could not explain the bonobo’s absence here. On the other hand, hunting is probably responsible for the elimination of bonobos from a large area of forest south of Kisangani, a provincial capital city with a major bushmeat market and long history of intensive hunting pressure. We were surprised, however, to find bonobos common within 30 km of the city of Kindu, capital of Maniema and also a major commercial bushmeat center. Apparently intensive hunting is a more recent phenomenon in Maniema. 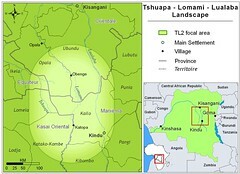 Western Maniema’s 12,000 km² southern mosaic of forest, savanna islands and rural settlement, crisscrossed by bike tracks and foot paths constitutes a home to an estimated 6750 bonobos (estimate range 4100 to 9800). This amounts to about three quarters of the TL2’s entire population of bonobos. 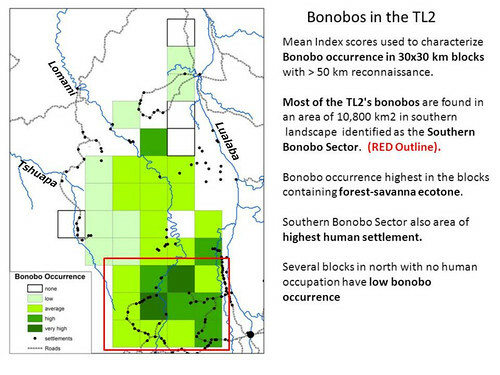 The distribution of bonobos in TL2 shows that whereas certain natural forest types are clearly avoided by bonobos, proximity to human settlement alone does not guarantee their absence. It is therefore possible that with effective control of hunting and habitat destruction, bonobos and humans can continue to coexist. This is a summary of John Hart’s presentation at the International Primate Society (IPS) meetings in Japan, 13-18 September 2010. This entry was written by Terese Hart, posted on 2010-10-01 at 5:04 pm, filed under Bonobo, Bushmeat. Bookmark the permalink. Follow any comments here with the RSS feed for this post. Post a comment or leave a trackback: Trackback URL. this distribution pattern can partly explained by the presence of a typical formation of forest in the forest-savannah ecotone. Low tree density and high abundance of marantacee understory. This forest type was well described in lope in gabon (lee white )and odzala in congo. Gorillas as well as bonobos prefere this nutrient rich forests. This forest type is also typical for some patches of old secondary forests. So the man might be the reason for patches of high bonobo densities deep in the forest. For salonga national park exist some studies of relationships between forest types and bonobo densities. And last not least a beautiful link. Dear Michael, thank you for your comment. Thank you for the interesting link. A very nice picture of Omari Ilambu too. And a well presented documentation that for we humans as well, the Marantaceae is also a source of food. Marantaceae heart is so appreciated that it is available even in Kinshasa’s markets. But I don’t expect to see our bonobo cousins getting theirs there any time soon. Great post Mama and Baba, I really enjoyed reading it and the following comments. The maps are truly impressive! The associations you are finding are very interesting. Baba, do you have specific diseases in mind that may have possibly led to the fewer number of bonobo up north? Your question about the role of disease is very appropos. At this point no one has found evidence for an epidemic that could account for “holes” in the bonobo’s range. Surveys for the health status and antibody profiles of free ranging bonobos are getting underway. Epidemics of Ebola have reduced populations of chimpanzees and gorillas over large areas. That something comparable has occurred for bonobos is entirely possible.